Just this month, Vtech released the V.Reader in stores nationwide. Before its release, I was contacted and asked if I would like to check it out with Alex. Can you guess? I was more than excited for this opportunity. Plays fully animated stories with story narration, character voices, vivid graphics and exciting music and sounds! To give you a better look at the V.Reader and how it works, I put together a brief video. The story is Mr. Men/Little Miss: The Case of the Smelly Sock. Alex just loves this story and laughs at the same parts every time he reads it. We absolutely love the Vtech V.Reader in our house. Alex uses it almost daily and has even tried his hand at quite a few of the games on the cartridges. Now, these games are a tad advanced for a 3 year old, but I'm excited for the things he's learning from them (i.e. syllables). The hubster and I like it enough to invest in it and buy Alex a few more stories. We're also excited to purchase a memory card and download stories for the V.Reader as soon as we're able to. I see this as something that will grow with Alex while helping him develop skills along the way. What a wonderful learning tool this is! I highly recommend purchasing this for the little ones in your life as well. The holidays are right around the corner, you know? 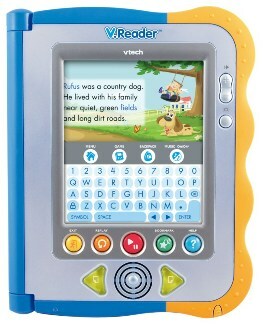 BUY IT: You can purchase the Vtech V.Reader for $59.99.